HP LaserJet 5100 250-sheet optional lower cassette. Part number Q1865A. The adjustable tray in this feeder can hold all 3 popular page sizes: letter, legal, and 11"x17". 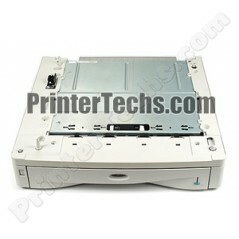 Compatible with: HP LaserJet 5100, 5100T, 5100N, 5100TN, 5100DTN. Refurbished unit comes with a full 90-day warranty. Adjustable tray: letter, legal, 11x17 paper. This product is easy to install -- it is placed directly underneath your printer.